NACE® is a non-invasive prenatal test. This means that it is completely safe for you and your baby. 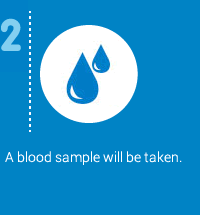 A small blood sample taken from the arm, just like in any other routine blood analysis, is sufficient to run the test. NACE® uses the latest sequencing technology to analyze fetal DNA compared to maternal DNA to detect certain anomalies with high precision and reliability. NACE® is a non-invasive prenatal screening test that analyzes the most frequent chromosomal alterations without compromising the pregnancy. 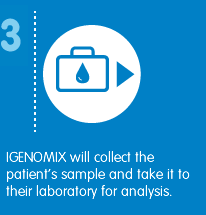 NACE® has the highest informativeness rate in the market: we obtain results for 99.9% of the analyzed samples. What is NACE® Extended 24? 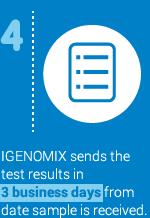 NACE® Extended 24 is an extended version that also incorporates the detection of all chromosome trisomies, and identifies five microdeletions which are associated with major genetic syndromes. 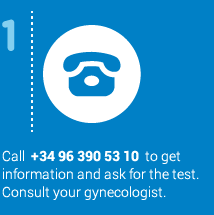 Guidelines from the European Society of Human Genetics and the American Society of Human Genetics state that further analysis of microdeletions should be indicated only in cases of certain ultrasound abnormalities since, in some cases, manifestations can be mild or moderate, making genetic counseling difficult. Results in 3 days* We deliver results in just 3 business days* from the moment the sample is received. *Turnaround time for Europe. Please contact us for more information. *Turnaround time valid for Europe. Contact us for more information. Send us the form and we will contact you.